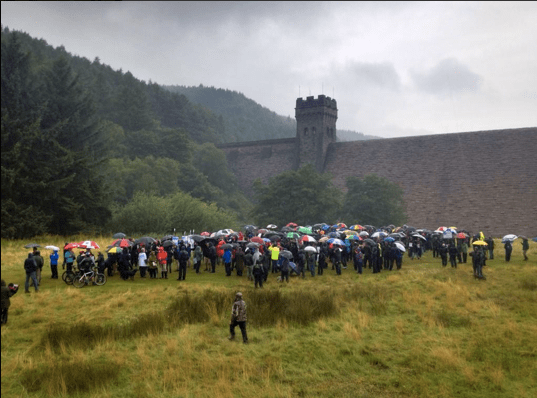 Hundreds of people gathered across the country in the pouring rain today in solidarity against the illegal killing of hen harriers. Our twitter feed has been awash with #HenHarrierDay and whilst the protestors are sodden from the rain we can see their enthusiasms have not been dampened. Mark Avery and Chris Packham have been promoting Hen Harrier Day for weeks in order to provide an opportunity for people to come together and express their outrage at the illegal killing and severe decline of the harrier. In Lancashire, Northumberland and the Peak District people stood up for this protected bird today with banners, placards and even painted torsos expressing their outrage at the bird of prey’s dwindling numbers. Whilst the hen harrier is listed on a global scale of least concern by the IUCN, the numbers of harriers in the UK have been critically diminishing. There is habitat available for over 300 breeding pairs to nest across the country, but as a result of persecution the 2014 season has seen only 3 pairs nesting in the English uplands. Why? Because they prey upon red grouse, reducing numbers available for sport shooting. Dr Mark Avery started an e-petition to the government calling for a complete ban on driven grouse shooting. Mark Avery and Chris Packham, along with over 12,000 supporters call for such a radical move because efforts from conservationists to work alongside the shooting organisations are unfortunately failing. Shooting organisations maintain that the management of the land for grouse leads to benefits for wildlife, but conservationists argue that managing such a large number of grouse for shooting requires intensive farming involving draining and burning the upland moorland and removing unwanted predators – damaging the natural ecosystem. Whilst Hen Harrier Day is to draw attention to the plight of the hen harrier in general and will hopefully continue for years to come, the protestors want the grouse shooters to sit up and take notice of how bad things are getting. If a total ban is the only way to do this, then that’s what they’re going to fight for – come rain or storm. Hen Harrier Day 2014 is supported by: the RSPB, the Wildlife Trusts, the National Trust, the Hawk and Owl Trust, the League Against Cruel Sports, the Peak District National Park, Birdwatch magazine, Rare Bird Alert, Welsh Ornithological Society and Quaker Concern for Animals. You can view the petition here, and sign it if you want to support the cause. Previous ArticleFeeding 3 billion – easier than you might think? Hope for a tricky breeder: could new information safeguard the Iberian lynx from further declines? Sadly, the National Trust did not support hen harrier day – they don’t seem to be opposed to illegal killing of raptors. And the Peak District National Park Authority chief didn’t support it either. Well, I say sadly but of course I mean shamefully.